Trinidad and Tobago's senior footballers suffered a setback in their opening match of the 2008 Digicel Caribbean Championships with a 2-1 loss to Grenada at the National Stadium in Kingston. Grenada's Kitson Bain opened the scoring against the run of play when he nailed home from the centre of the box after Ricky Charles centred from the left on 37 minutes. Charles had picked up on a ball as the T&T defence was caught flat footed awaiting an offside call. T&T dominated for long periods and had only themselves to blame for not having at least three goals on the scoreboard at half time. Cornell Glen, Khaleem Hyland and Anthony Wolfe were the chief culprits. In the second game, a Luton Shelton injury time penalty gave Jamaica a come from behind 2-1 win over Barbados. In the earlier encounter, Wolfe had a header crash off the near right post after Keon Daniel found him from way out on the left. From the follow up play after Grenada failed to clear, Glen missed the target after Hyland laid back from inside the box on 31 minutes. Hyland also spanked one inches over in the 21st. T&T were guilty of lackluster play but still had sufficient chances to put the match away. Andre Toussaint was a second half substitute but could only manage a couple weak attempts on goal. Four minutes into the second half, Clyde Leon's free kick effort from 20 yards out forced goalie Desmond Noel to save but the rebound fell perfectly for an onrushing Glen who somehow manage to miss from inside the six yard. With time ticking, Glen and Aklie Edwards combined on the left with the latter making the overlapping run before playing into Glen who pushed past three players before burying his shot into the corner for the equalizer on 69 minutes. Grenada lost shape after that but while T&T squandered further chances to take the lead, they lost steam at the end and paid the price. Two minutes into added on time, Charles met an ordinary right side ball and sent a lunging header towards the far right post which bounced off the inside of the post and trickled over the line before a scampering Marvin Phillips could clear. There was huge roar around the stadium from the 3000 odd Jamaican fans who turned up for the second game between the hosts and Barbados. T&T also went into the match without the services of striker Errol McFarlane after his Lebanese club Al Mabarrah requested that he take no part in the tournament and return to the club. T&T next face Barbados in Montego Bay on Friday. Trinidad & Tobago: - 21.Marvin Phillip, 2.Clyde Leon, 4.Makan Hislop, 5.Keyeno Thomas, 6.Khaleem Hyland, 7.Anthony Wolfe (10.Andre Toussaint 67th), 9.Aurtis Whitley (capt) (15.Arnold Dwarika 72nd), 13.Cornell Glen, 16.Seon Power, 17.Aklie Edwards, 19.Keon Daniel. Subs not used: - 1.Jan Michael Williams, 14.Julius James, Cyd Gray, 3.Avery John, Osei Telesford. Grenada: - 30.Desmond Noel, 3.Shannon Phillip, 4.Cassim Langaigne, 6.Marc Marshall, 9.Ricky Charles, 10.Kithson Bain, 11.Anthony Modeste, 13.Dwayne Leo, 19.Fimbar Williams (17.Kwan Baptiste 72nd), 23.Junior Williams (14.Marcus Julien 79th), 25.Shane Rennie. Subs not used: - 1.James Raeburn, 5.Michael Mark, 27.Marvin Fredericks. Spice Boys stun Soca Warriors. By: Howard Walker (JA Observer staff reporter). Grenada showed they will be a force to be reckoned with in this year's Digicel Caribbean Championship after they scored a close 2-1 win over many-times champions Trinidad &Tobago in the opening Group A game at the National Stadium yesterday. Despite missing a 17th-minute penalty by Jamaican-based Anthony Modeste, Grenada stunned their fancied opponent courtesy of goals by Kithson Bain in the 36th and Ricky Charles in the 90th. Cornell Glen levelled the score for T&T in the 69th minute with a brilliant solo effort, but will have to play catch-up in the four-team group which also involves hosts Jamaica and Barbados. Grenada and Jamaica lead the group after the latters' identical 2-1 win over Barbados in the late game. Modeste, who captains Portmore United in the local Digicel Premier League and is the player/coach of Grenada, said he was truly happy for the victory. Said Modeste: "We've worked hard over the past few months and we're dedicated in doing our jobs and going far. We've already crossed one hurdle so we'll just saviour this victory and prepare for the next game on Friday." Meanwhile, technical director of T&T, Franciso Maturana, said through an interpreter that if a team does not take its chances it is going to lose. "Crying don't achieve anything, we need to take what happened today and build for the next game," said Maturana, while acknowledging that, "this is the best team that we could have at this time". T&T, eight-times winner of the Caribbean tournament, could have problems advancing from the group stage in what is deemed the 'group of death'. 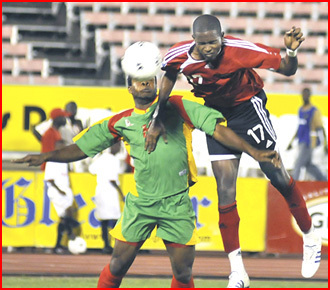 In front of a small gathering for the opening 2008 tournament, Grenada - dressed in red, green and yellow - took the fight early to T&T and should have taken the lead in the 17th minute. Guyanese referee, Otis James, awarded a penalty to Grenada for an infringement in the box, but goalkeeper Marvin Phillips dived correctly to block a modest kick from Modeste. Moments later, T&T's Anthony Wolfe's diving header hit the upright in a game that had plenty of chances for both teams. Grenada took the lead when Bain slotted home a Ricky Charles cross from close range in the 36th minute. T&T came out running in the second half but missed a few clearcut chances and the writing for an upset was on the wall. They found the equaliser when Glen scored a brilliant sole effort in the 69th minute after collecting a ball just outside the box and weaving his way inside before curling a beauty just inside the upright. But just when it seemed both teams would settle for a draw, Charles popped up to volley home in the dying minute for maximum points for Grenada.